(...) none can equal the rich and transparent surround sonics of this live recording. Polyhymnia International were responsible for the recording, and they don't stint on the surround channels; the rich sound of the orchestra's massed strings seems even better than it did under Ormandy. Eschenbach's live recording of Shostakovich Five with the Philadelphia is a monumental reading, seeking drama in the work's gaunt architecture. (...) an intensely lyrical performance of the desolate Romances on Poems of Alexander Blok. As a conductor and on piano, Eschenbach seems to be as intimately familiar with the music of Shostakovich, as he is with Mahler's works of his predilection. Christoph Eschenbach's engaged leadership makes audible, how much the orchestra owns of instrumental virtuosity, uniformity in sound, clear intonation and cultivated taste (...). His musicianship combines objectivity and meticulousness with well-dosed emotions. One Five that won... - This release in the successful recording series with The Philadelphia Orchestra and its Music Director Christoph Eschenbach features Dmitri Shostakovich's epic and monumental Fifth Symphony, which has become a signature piece of the orchestra. The Largo movement - one of the most heartrendingly beautiful slow movements written by the composer - and the bombastic Finale of this perennially popular work provide for an entrancing super audio listening experience with the world-renowned sound of The Philadelphia Orchestra. Officially viewed as "the practical creative reply of a Soviet artist to just criticism," this symphony was the Russian composer's mid-career coup - after his music had been politically attacked, he got back into the good graces of both communist officials and the public, who stood and cheered its première in 1937. 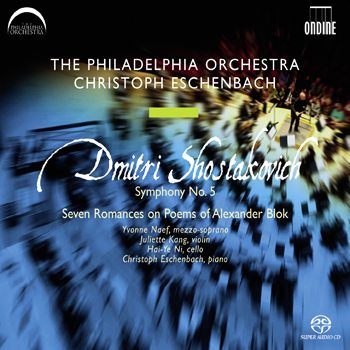 An added bonus of this CD is the spellbinding song cycle 'Seven Romances on Poems of Alexander Blok' (1880-1921), making this unusual coupling a unique release; Christoph Eschenbach accompanies on piano the acclaimed mezzo-soprano Yvonne Naef and two members of the The Philadelphia Orchestra.